Update 6/20/2012: Microsoft has blocked Windows Live Messenger 2009 from signing in. You can use the Messenger Reviver utility to bypass the block. 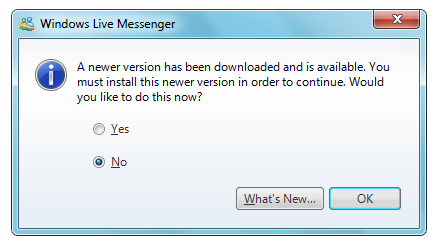 At some point when you next sign in using Windows Live Messenger 2009 (build 14.0.8089.726 – you know, the one that still has Webcam support), you’ll be forced to upgrade to either the latest version of Messenger 2009 (sans webcam). To get around this, simply use the latest version of my Link Reviver tool. Not only will you be able to click on hyperlinks again, but you’ll also be able to use your previous version with Webcam. I’ll be providing a better way to get webcam back soon. But if you need to do it now, use ZapMessenger to uninstall Messenger, download and run the Messenger QFE2 installer, and then use Link Reviver to restore it to be able to login. Right. You can see some of the previous explanations (see comments especially). This is hardly news for anyone who has used Messenger for awhile, and was generally expected by the Messenger community. This has happened before, with again, little to no explanation, bad installer versions, and even locking out certain versions of Windows. Posted on January 21, 2011, in Uncategorized. Bookmark the permalink. 49 Comments. I’m downloading this tool because some of my computers are not connecting at all, “service not available” and some of them just fails. I guess this is what I need to totally get rid of the Live messenger annoyance that it leaves behind when properly un-installed. Signing in to Windows Live Messenger failed because the service is temporaly unavaiable. Please try again later. Greetings Flaviano. The 80040154 means that it’s trying to access a COM class (in more literal terms in Messenger-context, probably a DLL) that isn’t there. May I ask how you got it installed? In a lot of cases you’ll get the 80040154 is when you don’t install the Contacts platform for the 2009 versions, which is a requirement for Messenger. Feel free to just download and run it to make sure you have it installed. any chances you can help me with my login problems? After the “forced upgrade thing” I’m using the .726 you provided, zapped everything but can’t login. It gives me the 80048103 error code. My OS is Windows XP. Your help would be really appreciated. I think you mean Windows Live Essentials 2009 from here, which albeit classified as “for Windows XP” will work on Vista and Win7, although you have to make sure that Windows Update doesn’t update you to 2011 in that case. Basically you just reinstalled 2009 – it’s the same setup file as before. i followed all the instructions and they worked finely but one problem though,i cant share webcam.i meant it does provide the option “show webcam”.however when i click on it,it says ” recipient decline smthg..” in short it doest work. do you know how cn i solve this please? one more thing,am i nuts or is it the quality of video call in WLM09 is much better compared to the one in WLM11?? Greetings Anoushka. The problem here is because your contact needs to be using Messenger 2009 version 14.0.8089.726 too. If they use the newer version of 2009 or 2011, it will automatically decline as you’ve described (they won’t even see the invitation!). and click OK. Then they’ll need to download and run the 726 installer from here. Then finally because Microsoft blocked it they’ll have to run the reviver, which you already know about. I hear you on the quality as well, I much prefer the quality of webcam to video call. Thank you loads for this quick reply. I think this sums up a lot of people’s feelings: (Error: 0x8ac70907) FML! sorry to bother again but will this work for someone using Windows Vista as well? i meant i dont know which version of msn does vista people use..but still.please could you let me know as soon as possible. …… has accepted your invitation to start sending webcam, but after some time I am recieving following: The webcam session has ended or Your MSN isn’t responding, Please retry again the connection or relogin to solve the problem. Can you provide some hint? Hi. what about MSN 8.5? I would love to stick with 8.5 with webcam on. but i google couldn’t find any result. do you have nay idea how to fix it still use 8.5 with cam.